[UPDATE Dec 17: Election Results] Kim Wilson [PLP] has defeated Ed Bailey [OBA] in C#34 Sandys South Central. Ms Wilson has served in the Senate and Cabinet, but this will be her first time in Parliament. The upcoming election will see two lawyers face off in Sandys South Central; with Kim Wilson standing for the PLP, and Ed Bailey representing the OBA. Mr Bailey has not yet been officially rolled out, however has been canvassing the area. The incumbent is veteran politician Walter Lister, who is retiring from politics. In the 2007 General Election, Mr Lister won 69.26% [649-284] of the vote vs the UBP’s Sarah Burrows. In the 2003 General Election, Mr Lister won with 66.59% of the vote against Ed Bailey [UBP] who received 28.72%. 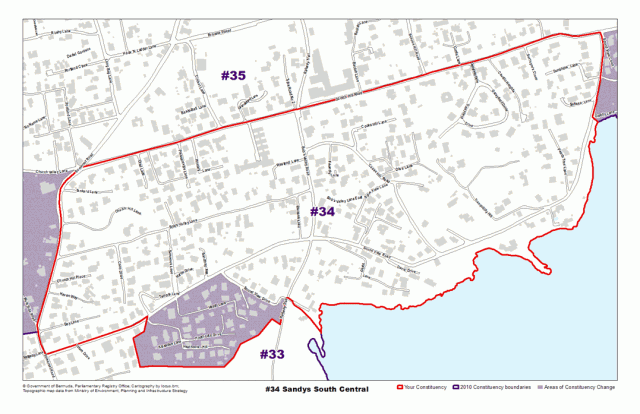 Areas the Sandys North Central constituency compromises of, or is located by, include Church Valley Lane, Sound View Drive, Sound View Road, and Somerset Road. Kim N. Wilson obtained her Bachelor’s Degree in Psychology from the University of Illinois, a Master’s in Education from Indiana University, and a LLB from London University in the United Kingdom. She was admitted to the local bar in 1995. Ms. Wilson is married to Dr. Kent Simmons. They reside in Sandys Parish and have 2 children, Niara, aged 10, andKent II, aged 7. As a retreat from her active life she enjoys spending time with her family, gardening, cooking and boating. Ed Bailey was born in Sandys Parish in the family homestead, which remains intact at 7 Bob’s Valley Lane, Constituency 34, Sandys South Central. He and his wife continue to live in the parish. He served in the Bermuda Police Service for 14 years and achieved the rank of Inspector. He was then called to the Bermuda Bar as a lawyer and now owns his own law firm. Currently, he sits as an acting magistrate in the lower courts. He attended West End Primary and Sandys Secondary School and had the honour to be the first lawyer to graduate from these two academic institutions. A home-grown Somerset man, he and his wife Rosalyn own Bailey’s Enterprises, which does business in the parish. He has served on the St. James Church Vestry. As Past President of the Cricket Board of Control, he has fond memories of the visiting international cricket teams who played many matches against our young cricketers. He has served as a Member of the House of Parliament, and been a member of the Tourism Board, the Public Service Board and the Vehicle Licensing Board.